Best Camera is an old acquaintance of the App Store. Ubermind’s app is easy and especially good for beginners that don’t need many different options and huge collections of filters, but still want to make their photos better with just a few touches. Best Camera got a recent update, so we seized the opportunity to review it at once. Share via Facebook, Twitter, Flickr, email. 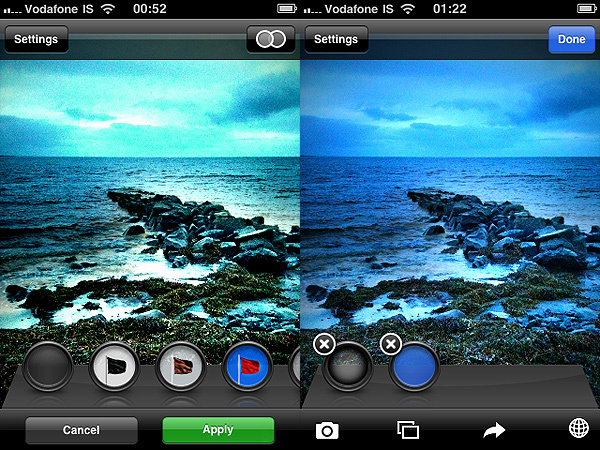 Best Camera is a great app for users that are looking to apply very basic modifications to their photos. Ubermind’s app features simple functionalities and allows you to share your photos either via email or Flickr, Twitter, Facebook or on the bestcamera.com community. The interface of this app is very pleasant and it still holds very well, even if you compare it to most of the more recent apps. It’s quite an impressive result and evidence if you develop a good app it will be valid for a longer time than you might have expected. You either take the photo or load it from your camera roll, then you can enhance contrast, saturation, turn your pictures into black and white or sepia, add a simple white border or black vignette, and so on. You can apply as many filters as you like to your photo and very conveniently disable each of them separately at any moment, but you are not given many customization options. It’s true that from the settings you can choose a 50% intensity for some of the filters, but you cannot adjust single parameters more than that; you cannot choose the right format to crop your photo (the app will automatically crop your photo); you cannot define intensity of vignetting. Despite these limitations, Best Camera works quite well and it’s amazingly easy to use. But honestly, despite the recent update, Best Camera remains a little behind many of its more up-to-date colleagues, which for the same price or even less offer you much more choice and much more freedom. Compatibility: iPhone, iPod Touch, iPad. iOS 3.1.3 or later.